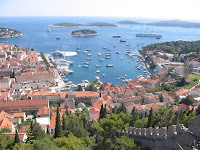 Hvar is quickly changing from a beautiful backpacking destination to a five star hang out for the rich and famous. But that shouldn’t put you off. The reasons for its increasing popularity are obvious – gorgeous beaches and secluded coves hidden under tall, ragged mountains and quaint towns with marbled streets. Who wouldn’t want to go? And it’s still affordable for people travelling on a budget despite the influx of the well off. When you arrive on the boat fom Split you are met by hoards of locals desperate to have you stay in their home. This is how many of the locals make their living and i’d recommend doing it, most are very friendly and will give you a more authentic stay on the island. Plus there is very limited backpacker accomodation so unless you’re ready to splash out then it’s the only option! When you’re there it’s very easy to keep yourself busy. Wander the beautiful streets and take in the medieval delights that will lead you all the way down to the crystal clear waters where you can relax all day long, day after day. It’s hard to get bored of that sort of scenery, but if you do there’s always a party on offer in Hvar, whether it’s day or night. Head to Carpe Diem, a bar in central Hvar, which will allow you to party your heart out even if it’s 3 in the afternoon. Discover more of the beautiful destinations in Europe and share your own thoughts on Hvar in the comments, i’d love to hear if you agree with the opinions here.